The embryology team at Bourn Hall Clinic near Cambridge evaluated the use of a new sperm selection medium called SpermSlow™ to see if it had benefits during Intra-Cytoplasmic Sperm Injection (ICSI). Good results from a small trial justified a change in procedure in the clinic and the findings were presented in a paper at the 2013 ACE conference. ICSI is a technique used when there is poor sperm quality and a low sperm count. A single spermatozoa is selected and captured with a very fine pipette and injected directly into the egg, which is known as an oocyte. The embryologist is looking for a mature sperm with good movement (motility). Normally the sperm are swimming freely in the fertilisation medium but the embryology team decided to trial the use of SpermSlow instead. SpermSlow is a viscous medium containing hyaluronic acid, which is naturally occurring and biodegradable. As the sperm suspension mixes with SpermSlow, the more mature and viable sperm slow down and the immature sperm keep moving. In a small trial, 126 patients having treatment with ICSI from 1st March – 30th August 2010 were included in the data set. Oocyte injection was performed with or without SpermSlow, and the results compared for oocyte viability, fertilisation, early pregnancy loss (EPL) and clinical pregnancy rates. When comparing the oocytes that had been injected using fertilisation medium only and those using SpermSlow there was no difference in the fertilisation rate or the clinical pregnancy rate. However, the use of SpermSlow does appear to lower the early pregnancy loss (33.3% vs. 11.8%). This may be because there was a reduction in the DNA fragmentation. 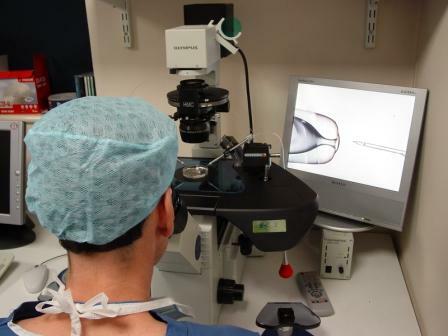 Although the patient sample was too small for the results to be statistically significant, this finding and the preference of the embryologist means that SpermSlow is now used for all ICSI procedures within the clinic. Find out more about our treatments for male factor infertility here.